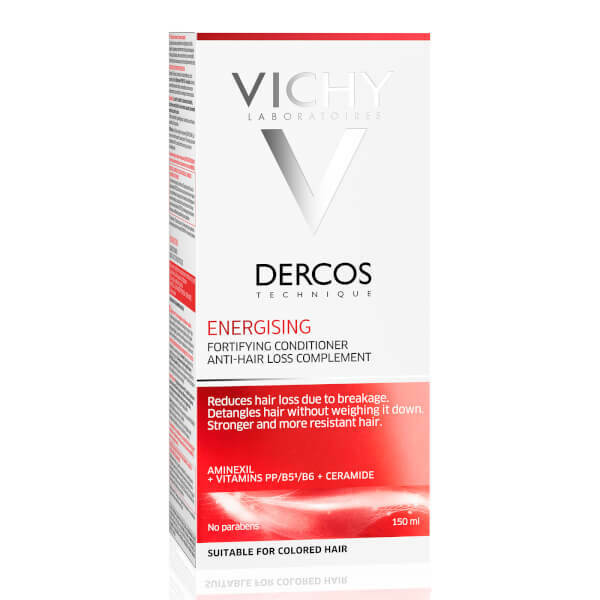 Combat hair loss with the Vichy Dercos Energising Conditioner; a nourishing, gentle conditioner that is ideal for weak, damaged hair prone to breakage and thinning. 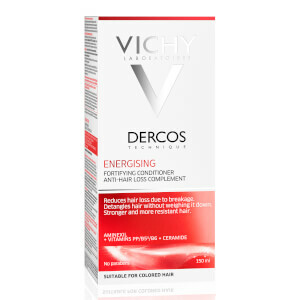 Lightweight and non-greasy, the effective treatment has been fortified with an Aminexil complex; an effective pharmaceutical molecule that actively stimulates collagen and flexibility at the root to ensure a greater bond to the scalp. A harmonic blend of vitamins and Ceramide help to reinforce weak and fragile hair structure, minimising the look of split ends and hair loss, resulting in stronger and more resistant follicles. With continued use, locks appear replenished and full of vitality from root to tip. Free from parabens and sulfates. Hypoallergenic. Dermatologically tested. Use after the Energising shampoo, on rinsed and damp hair. Leave in for 1 to 2 minutes, then rinse thoroughly. In case of contact with eyes, rinse them immediately. Aqua/Water, Cetearyl Alcohol, Behentrimonium Chloride, Starch Acetate, Cetyl Esters, Chlorhexidine Digluconate, Diaminopyrimidine Oxide, Hydroxyethylcellulose, Isopropyl Alcohol, Niacinamide, 2-Oleamido-1, 3-Octadecanediol, Panthenol, Pyridoxine HCI, Parfum/Fragrance, Code F.I.L : C187336/1.